God's Love is Reflected in You - Beautiful way to thank volunteers and staff members alike for their service! Imagery is a mirror reflection of Cathedral Ledge in Echo Lake (White Mountains of New Hampshire). The featured Scripture selection: The LORD your God has blessed you in all the work of your hands. 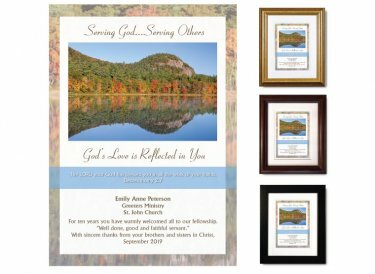 You'll personalize this memento with the recipient's name, job title, and the name of your church or organization. Four linves are provided for you to add your own special sentiment as well. Framed & Finished - Printed on premium paper with archival inks and double-matted with conservation-grade matboard as above; mounted using acid-free foam core backing; framed using distortion-free UV acrylic glazing. A protective dust cover and wall guards are applied to the back. Your choice of gold, walnut or black wood frame (view frames here); ready to hang. Finished size: 10"x12"